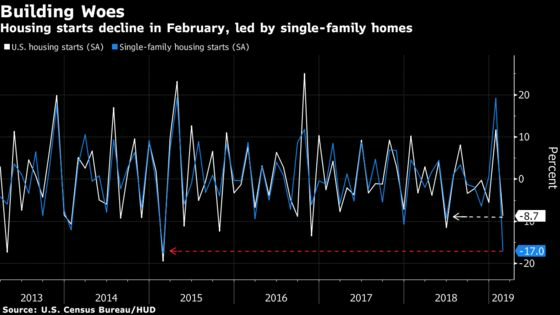 (Bloomberg) -- U.S. new-home groundbreakings fell in February by the most in eight months on a drop in single-family homes, suggesting buyers and builders remain wary despite higher wages and a drop in mortgage rates. Separate reports Tuesday showed mixed results for housing in January. The S&P CoreLogic Case-Shiller index rose 3.6 percent from a year earlier, the least since 2012, while the Federal Housing Finance Agency measure rose 0.6 percent for the best monthly gain in almost a year. Later this week, reports are forecast to show pending home sales cooled in February while transactions for new homes rose. A gauge of homebuilder shares declined amid a broader advance in U.S. stocks. Some reports have indicated a pickup in housing in the first quarter, with existing home sales -- which account for about 90 percent of the market -- soaring in February by the most since 2015 and homebuilder sentiment increasing this year. The housing starts data have a wide margin of error, with a 90 percent chance that the headline figure was between a 19 percent drop and 1.6 percent gain. Single-family starts slumped the most in four years while permits were unchanged. Starts for multifamily homes, a category that tends to be volatile and includes apartment buildings and condominiums, jumped 17.8 percent as permits fell 4.2 percent. Three of four regions posted declines, led by a 30 percent drop in the Northeast, where single-family starts dropped the most in four years. The West also declined as the single- family category saw the steepest drop in a decade.